HOW DO I LAY A PATIO? With summer approaching, make sure you have your garden patio ready. Here’s how to lay a patio in 6 easy steps. QUICK TIP: WHAT SAND SHOULD I USE FOR LAYING A PATIO? Wondering which type of sand to put with cement for your concrete mix? To get the best results, use sharp sand. It’s perfect for patios and gardens, and will prevent moles or rats from tunnelling underneath the paving slabs. Before even thinking of laying paving slabs, you need to prepare your patio area. If you’re upgrading paving slabs that are already in place, dig these up before beginning. Dig a depth of around 150mm across the whole area, making sure the soil is evenly compacted. Then tip in the sub-base, raking it into a consistent depth of 100mm. Make sure it’s smooth, flat and firm. Prepare a concrete mix of three parts sand and one part cement, adding water to create a doughy consistency. You can use a cement mixer, or a large tub or bucket. To check the mix is thick enough, pick some up and mould into a ball. When you let go, it should retain its shape without oozing water or falling apart. You’ll need to make enough concrete to make an even 40mm layer in the patio bed. 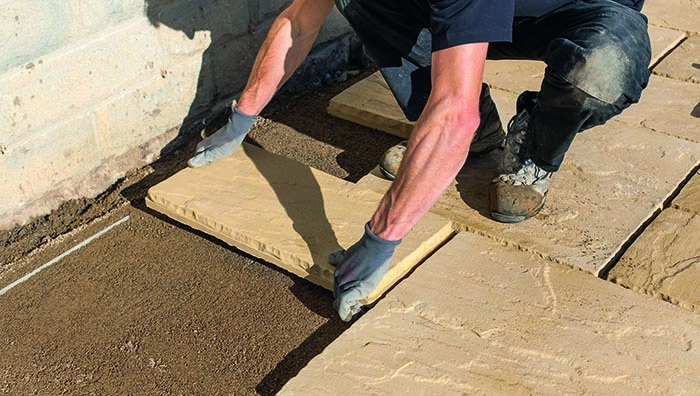 Before you can start laying slabs, you need to dampen them so they don’t dry out your concrete too quickly. Then, lower your first paving slab into position. Lay it into the concrete mix and gently tap it with a rubber mallet so it’s fixed in place. Ideally it wants to sit 15mm in the mortar. Repeat this process, leaving a 10-15mm gap between each paving slab, until your patio is covered. Once you’ve laid your patio, spray the whole area with water until it’s completely saturated, and leave it to set for at least 24 hours. The final part of laying a patio is applying the finishing touches. Use a trowel to fill the gaps between your paving slabs with Marshalls Weatherpoint 365, ensuring there’s no residue on the slabs’ surface. Then, you might want to create a decorative border by digging a gutter around the perimeter, and filling it with some sea washed aggregate or black polished pebbles. Prefer your patio to be installed by an expert? Click here to find your nearest Marshalls-accredited installer.